The photography rewards in polar regions are unrivaled, but working your camera when the weather goes bad isn’t always easy. 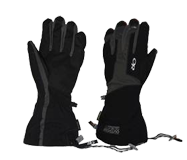 Enter the Gore-Tex/Fleece Flexi Glove with a waterproof, windproof outer shell and a cozy, finger-gripped fleece inner lining. Elongated gaiters cover your lower arms and wrist-hold loops allow the shells to dangle on your arms so they don’t drop into the sn ow as you snap away with your camera! Features: Carabiner loop, windproof, wicking, waterproof, SuperCinch™ gauntlet closure, silicone grip liner palm, removable liner, heat pack pocket on back of liner, durable, breathable, pre-curved construction, temperature rating to -20 degrees. Measuring Guide: Measure around a flat hand at the knuckles; do not include your thumb. Also measure your hand length from the base of your palm to the end of your middle finger. 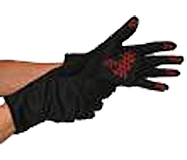 Use the larger of the two measurements to select your glove size.